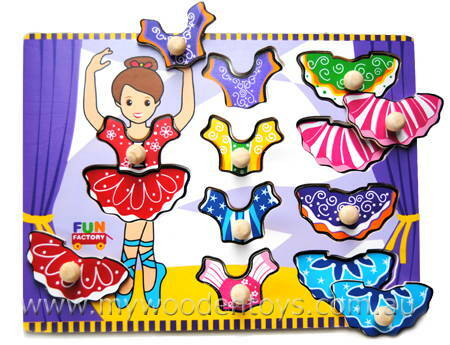 Ballerina Wooden Knob Puzzle is very pretty ten piece puzzle which shows a Ballerina doing a pirouette in a tutu. This ballerina comes with five outfits which you can mix and match by slotting them into the space provided on her body. This is a wonderful toy for fine motor skills and colour matching. Each shape when removed from the puzzle has a corresponding picture underneath it. We like this because: "A simple puzzle which will give lots of enjoyment."